My youngest 3 kiddos and I drove to Chicago to celebrate Christmas with our family. We were on the road for 20 hours to get there. Twenty hours. TWENTY HOURS! In that time (and during all the other road trips I've taken with my kids) I learned some things. Things that I will happily pass along to you because really, no one should ever have to endure the stench of chili dogs the second time around (if you know what I mean) for 20 hours. 9. Download music or bring along CDs because some states (I'm looking at you, Tennessee) do not have much variety in radio stations unless you want to sing along to Kenny Rogers and Merle Haggard the whole way. 8. Use the child locks on the windows. They are there for a reason, and I'm pretty sure that reason is so bored kids don't throw stale donut holes out the window and into the bed of the pickup truck next to you. 7. Bring food. Now I know there are people who will say that shoving food down your kids' throats just to get them to shut up for 5 minutes is simply not good parenting. Those people have not spent 20 hours in a car with my kids. I reiterate - bring food. 6. Do not ask your children if they need to use the bathroom when you stop for gas because they will not need to go until you're back on the road and 5 minutes away from the last stop. Force them to go. Threaten to sing Barry Manilow tunes if they refuse. 5. Pack a small bag for each person with pajamas, toothbrush/any other toiletries they need, and clothes for the next day. It's much easier for each person to grab their small bag when you stop at a hotel for the night, than to search through the big suitcases for what you need. 4. If you don't already have it, get AAA. Best. Investment. Ever! 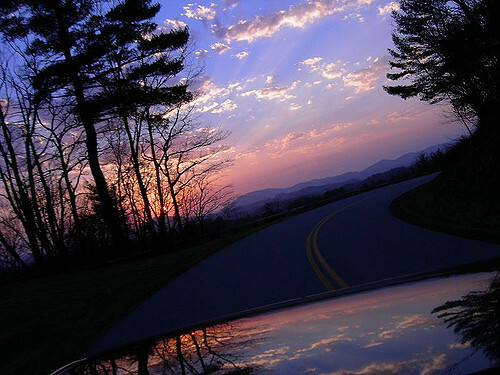 A flat tire on the side of the road does not have to be a catastrophe. 2. Bring garbage bags and diaper wipes even if your kids are well out of diaper-wearing age. Someone, whose name rhymes with Looklyn, once threw up in the middle of Indiana. If the thought of smelling vomit-covered clothing through 5 states is unappealing to you, you'll be happy to have garbage bags and wipes. 1. Did I mention using the child locks on your windows? If you need another reason, do it so your child can't lure Bigfoot out of "squatchy-looking" areas with beef jerky. Recently, a classmate of mine from grade school posted a picture on our elementary school's Facebook page. It was a photo of an old cookbook that had been created with recipes our parents had submitted. Several of us made comments that we remembered the cookbook, or that our parents still had that cookbook. I noticed the name on one of the comments and realized it was from my 4th grade teacher. My immediate reaction was to write, I still have nightmares of 4th grade and of you! That was the worst year ever! You were a terrible teacher! But thanks to the fact that I'm now an adult and have the ability to hold my tongue at least 50% of time, I instead replied, You were my 4th grade teacher. You hated me. I'm proud to report that I did not return with, Wow. I'm scared to think of how you treated those students you really disliked! I have terrible memories of the 4th grade and my teacher who I'm convinced hated me. And whether or not she did in fact, dislike me, those are the memories with which I've been left. Another classmate messaged me privately and admitted that he always felt this same teacher hated him. He recalled an incident where, in anger, she dumped over his desk in front of everyone. According to this classmate, it happened often. He spoke adamantly of the things this teacher did and said, and how awful 4th grade was for him. It has been nearly 40 years since the 4th grade. Forty years. Of course everyone has the chance to positively or negatively affect the people around them every day, but educators have a unique opportunity to dramatically impact a child's life. Think back to all the teachers you had in school. Is there one (or hopefully more!) 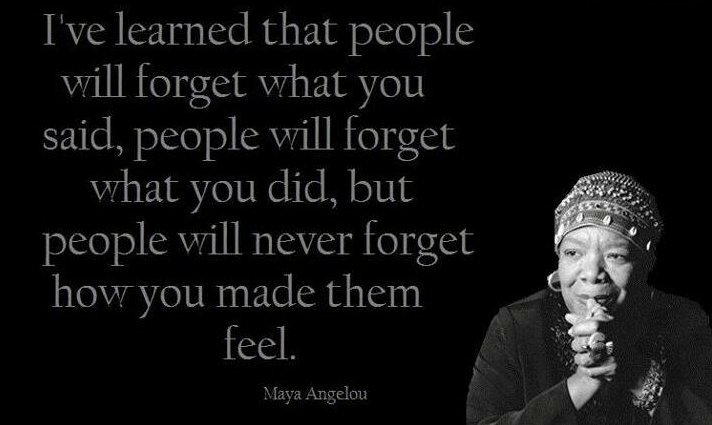 that stands out as someone who made learning fun, who believed in you and pushed you to do your best, who was interested in you and respected you as a valued member of the classroom? Now think back and try to recall if you had a teacher(s) that made you cheer when they were out sick because it meant you'd have a sub for the day. 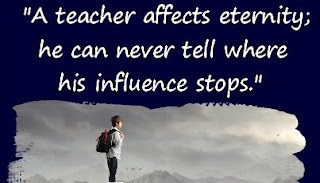 Those teachers were the ones who seemed disinterested in you, bored or angry to be at school, apathetic, or demeaning. This encounter made me pause and think about the long-lasting effects of how you treat others. I mean, if a person can remember a teacher from forty years ago with a veritable sense of post traumatic stress disorder, it makes me wonder what people will remember about me in forty years. I wonder what kind of legacy I'm leaving. Am I positively impacting the lives of my students? Will they say things like, "Miss Meehan was always nice to me. She helped me to understand the work. She was friendly, patient, had a good sense of humor." I feel pretty confident that I am indeed showing the students that I care every day. Of course, this extends far beyond the classroom. As I said before, we all have the opportunity to positively affect the people around us every day. And I am just as confident that I am not indeed showing others around me that I care. The person pushing their cart down the middle of the aisle, oblivious to the fact that you're trying to get around them, the person driving 10 miles under the speed limit in the passing lane, the cashier who is rude, the coworker who doesn't appreciate you, the customer service representative who is unhelpful, the neighbors who stomp around upstairs - I am less than loving toward these people every day. Do your words and actions show that you care about everyone you encounter? If not, you can change that! You have the ability to stop and think; to consider your words and actions. Are they uplifting? Do they encourage? Do they show compassion? 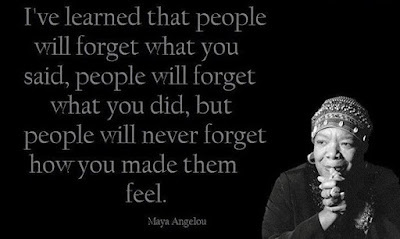 Or will you be the person who is remembered for being mean, uncaring, hateful?